During a recent road trip in which I probably didn’t bring enough music to last us (and by probably, I mean definitely) we stumbled on to this charming country song by Mark Wills on one of the random CDs that I brought! We liked it a lot! It’s a sweet love story about a two young people — Jacob and Rachael — who fall in love with each other. The problem? Jacob is poor while the girl is very rich. Because of this, the girl’s father refuses to let them be together, since he thinks Rachael can do better. So late one night, Jacob takes a ladder, climbs up to Rachael’s room, and they both run away with each other. Then, later, the father reconciles with the couple, and everyone lives happily ever after! A very sweet song, right? But, it also alludes to several biblical stories! After all, Jacob falls in love with Rachael — just as Jacob, the son of Isaac and one of the patriarchs in the Old Testament — falls in love with Rachel when he meets her at the well, as described in Genesis 29. And Rachel’s father is also very reluctant to part with Rachel! Still, while I’ll probably babble about the meeting at the well in another future blog, I wanted to focus on that idea of Jacob’s ladder. See, the title of the song, “Jacob’s Ladder” alludes to a strange and extremely vivid dream that Jacob had where God spoke with him. Because, according to the bible, heaven was really at the top of Jacob’s ladder! As can be expected for such a strange and vivid dream, there is much artwork by artists envision this wild vision. But the one that caught my eye the most was this one, by William Blake. 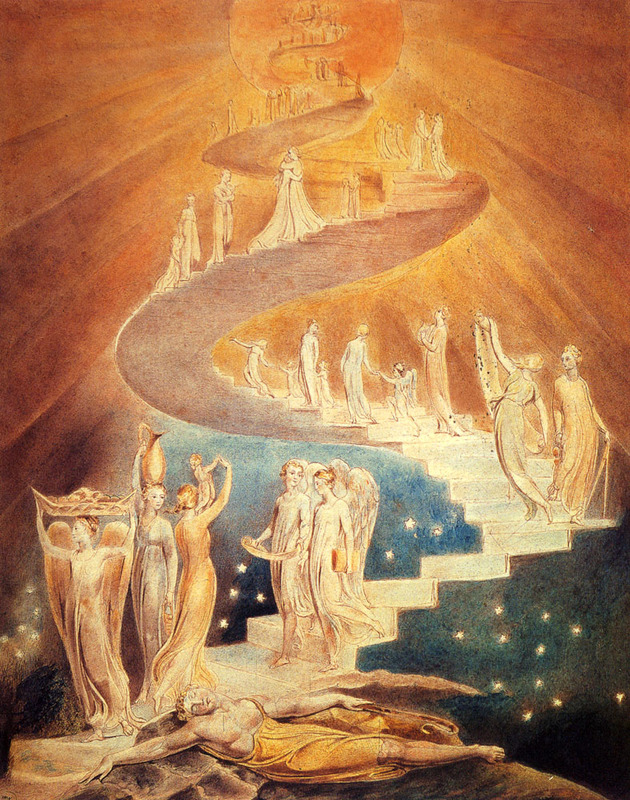 Jacob’s Ladder, by William Blake, c. 1799-1806. Private collection. William Blake was a strange person, though brilliant in his creativity — not only was he a fantastic painter, but he was also a fantastic poet as well. In fact, before I knew him as a painter, I knew him as a poet. His poem, The Chimney Sweep, has appeared in several great poetry anthologies that I own. Not only that, but the poem also deals with the idea of a transcendent dream in which someone meets up with God and receives a vision of comfort. The artwork is strange, for it gives us a glimpse as to what the supernatural world might be like. While we sometimes feel isolated or in darkness in the world, as Jacob is portrayed to be, there is an entire supernatural world that we do not know really anything about that encompasses us always. We know, of course, that we are part of the Church Militant — that is, the part of the Church which is living out our mortal lives and fighting sin as we go along, blind to the supernatural goings-on around us. There is also the Church Penitent — those who are trapped in Purgatory and waiting to be freed so as to be received in Heaven. Yet, even though there is a lot we don’t know, sometimes we will experience a strange, unexpected, transcendent experience in which we are certain that we have met up with the divine in an almost miraculous manner. So, what are we to make of these odd experiences? And here, Jacob shows us exactly what to do: to praise God, to respect that He is with us, and to follow Him. Thank You for being with us always. Let us to respect Your Real Presence in our lives and help us follow You.